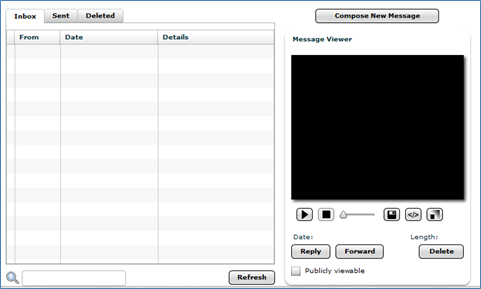 For those who worry about being misunderstood in email, how about video recording your message instead? 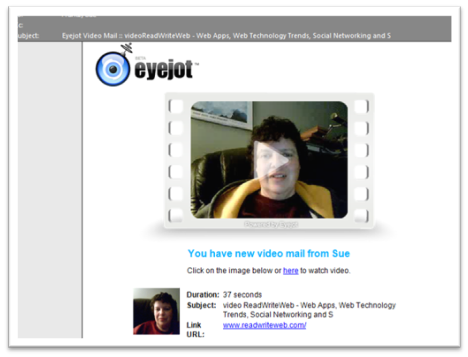 The cleverly named Eyejot provides an easy web-based user interface for recording and emailing video. They also provide a bookmarklet, a small program that runs inside your web browser, for attaching your own video commentary to web pages. Their bookmarklet is called “Eyejot This!” You just drag the bookmark to your browser’s bookmarks toolbar. Surf to any website, click the “Eyejot This!” bookmark. 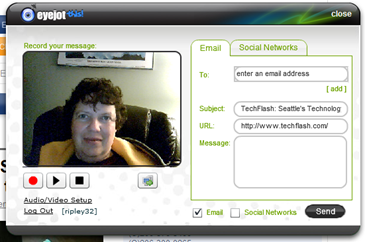 This window will appear – with your face on the screen, if your webcam is working. Hopefully you won’t see my face on your screen. That would just be creepy. Click the red record button. Say what you’d like to say. Hit the square black stop button. Type in the email address of who you’d like to send it to. Send a copy to yourself if you’d like the URL. 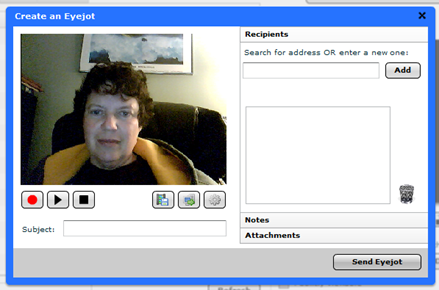 Eyejot keeps your old videos in your online Eyejot account; you can forward or delete previously recorded videos. The text of the email reads “click on the image below or here to watch video.” When you click the link, this is where you’re sent. Check it out. When I’m done recording, I type in an appropriate subject line, the email addresses of my recipients, add any written commentary I’d like to add, and include an attachment if I’d like. Click “send eyejot,” and that’s it. To cancel a message, click the X in the top right corner of the video recording screen. Before the beginning of a new term, I email my students with a link to my course website. Next term, I think I’ll add a little video commentary for a more personal touch. Eyejot is free for users who are fine limiting their recordings to one minute. If you’re on the wordy side, $29.95/year gets you five minutes of camera time.